Do Vegan Parents Raise More “Ethically Aware” Children? If someone had asked me this question a few years back, I would have stared at them, wide eyed & confused and said….”huh?… what do you mean?” It is difficult for me to believe, that I was once so completely clueless about something that I am so truly passionate about now. Veganism has become a way of life for my family, and everything we do in some way or another, reflects on our views of living compassionately. Every dollar we spend, every bite we take and even our words, define our “ethical awareness”. 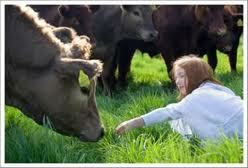 Back to the question, “do Vegan parents raise more “ethically aware” children? And do our children have a greater feeling of obligation, to help end the immoral treatment of sentient beings on our planet, along with the unthinkable abuse of our beautiful earth? As a Vegan parent, my answer is yes. Most omnivorous children have absolutely no idea of the pain that animals endure before their meal hits the dinner table. Aside from that, I have not met a child, other than my own & other Vegan children, that have any knowledge of how destructive corporate agriculture is to the planet. I think most non-Vegan parents want to shield their children from the unfortunate truth, and do not want their child to feel any guilt over what they eat. I also believe that many non-Vegan parents truly believe that eating meat and other animal products is how it’s meant to be, and there is nothing to feel guilty about. Until the children of the world become “ethically aware”, our next generation will continue follow in our cruel and immoral footsteps. We must open the eyes of today’s young people and make them understand that the selfish & unethical behavior of mankind cannot go on forever.